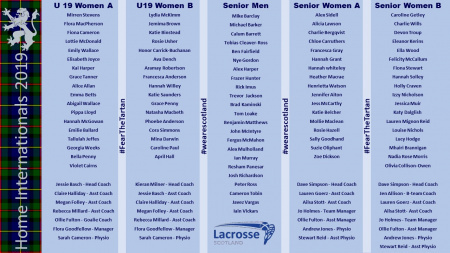 For the first time ever Scotland is sending 5 teams to Home Internationals, and we wish them all the very best of luck. Play fair, play hard and play with pride. The Home International Series takes place from 5th- 7th April at Aldershot Garrison Sports Centre, Aldershot, GU11 2TD England (map). For ticket & schedule information please (see ELA site). The 2019 Home Internationals will feature the Women’s Senior A & B and U19 A & B tournaments, as well as a Men’s Senior tournament so there is going to be wall-to-wall lacrosse. This year Germany are the guest nation taking part in the Women’s Senior and U19 A competitions. Scotland Women A will also be defending the Robertson Cup, which is awarded to the winner of the Scotland v Wales game. It is going to be a fun-packed few days, so if you are in the area come and join us.